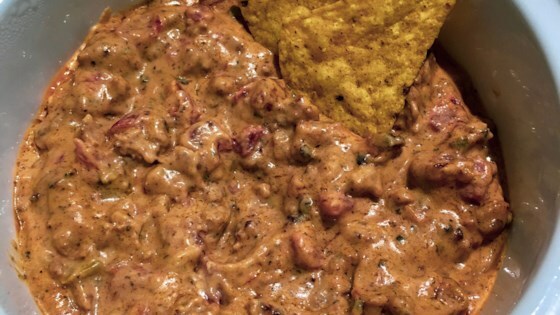 "This dip is hearty and a crowd pleaser. The 'boys' love the spice and the women love how easy it was to make. Serve with tortilla chips." Stir the sausage and onions together in a large skillet over medium-high heat until browned and crumbly, about 8 minutes. Drain the grease off of the sausage in a mesh strainer, then return to the skillet. Stir in the cream cheese and diced tomatoes until the cheese has melted and the mixture begins to bubble. Stir in chives before serving. very sorry-but this was not a great tasting dip & the look of this dip is really awful-sorry again but will not make this again. Very flavorful and EASY! Everyone loved it! I served it with bread, much better that tortilla chips.